El próximo jueves 4 de octubre, se celebra en Madrid el evento “Meeting Point 2012” organizado por ASTIC, con el lema “Las TIC para la sostenibilidad del Servicio Público”. Durante esta jornada, tengo el gusto de coordinar la mesa redonda: “CIO en la Administración General del Estado: ¿Ha llegado la hora?”. Para presentar la mesa he preparado unas líneas que os ofrezco a continuación. Estimados compañeros de ASTIC y compañeros de empresas de Tecnología, estimados invitados, buenos días a todos. Estados Unidos, Corea, Singapur, Suecia , Japón, Finlandia, Alemania, Reino Unido, Nueva Zelanda, Australia, Tailandia, Indonesia, … ¿Qué tienen en común estos países?. Según el informe “2012 World e-Government Ranking” del Institute of e-Government”, estos son los países líderes en el establecimiento de un CIO para la Administración, responsables ejecutivos de la Administración Electrónica, así como de la coordinación de las TIC en toda la Administracion. Según el informe 2012 de las Naciones Unidas sobre e-Government, el número de países con CIO en la Administración creció desde 32 en 2010 a 60 en 2012. 18 paises europeos ya lo tienen, siendo Europa la región mundial donde mayor porcentaje de países tiene esa figura. ¿Tenemos en España una figura CIO de la Administración o equivalente?. En principio, no. No parece que los Órganos actuales de coordinación, como el Consejo Superior de Administración Electrónica, o las Direcciones Generales que se ocupan de las Tecnologías de la Información en el Ministerio de Industria, Energía y Turismo, o de la Administración Electrónica en el Ministerio de Hacienda y Administraciones Públicas, estén en la posición ejecutiva apropiada para desempeñar las funciones de un CIO para toda la Administración. De modo que es legítimo plantearse la pregunta, ¿necesita la Administración General del Estado un CIO?. Y, en caso afirmativo, ¿cómo sería ese CIO?, y ¿cómo llegar a él?. ASTIC, nuestra asociación profesional, dentro del portafolio de propuestas para la mejora de la Administración por medio de la Tecnología, está estudiando la figura del CIO de la Administración General del Estado como un elemento clave para seguir avanzando en el camino que permite una mejor administración para los ciudadanos, con un menor coste. Por ello organiza, dentro de la jornada Meeting Point, la mesa de debate denominada “CIO en la Administración General del Estado: ¿Ha llegado la hora?”. Que tengo el honor de presidir. Para ello contamos con cuatro distinguidos intervinientes que arrojarán con seguridad luz sobre esta materia. The Government CIO was a very important indicator in Waseda e-Government ranking. The CIO was expected to align management strategy with ICT investment in order to achieve a balance between the business strategy, organizational reform, and management reform; hence, the Government CIO was considered by many governments to be one of the key factors in the success of e-Government implementation. In the Waseda survey, we split this indicator into four elements: firstly the presence of CIOs in government; secondly, the extent of their mandate; thirdly, the existence of organizations which fostered CIO development, and finally, the special development courses and the degree/quality which taught CIO related curricula. In the top of ranking was USA, Korea as 1st and Singapore in the 3rd. USA and Korea had the full score, which means that these countries had many CIO policies and strategies and they issued laws and legislations on CIO in order to develop e-Government. Singapore fell from the second place last year to the third this year, followed by Sweden at fourth. Compared to last year, Sweden had a big change in this indicator; the country climbed four steps. Japan was down to the fifth place. For the first time, Thailand and Indonesia rose to the high rank group of this indicator among the only Southeast Asian countries to do so. Currently, there is no official legal enactment of establishing ClO position in Spanish government. At national level Ministry of the Presidency is responsible for steering the development and implementation of e-Government in Spain. The Ministry of Industry, Tourism and Trade is responsible for conducting the Avanza Plan – now in its second phase, Avanza 2 (2009-2012). Among the key objectives of this plan is the full development of e-Government. The Ministerial Committees for Electronic Administration are the instruments for the internal coordination of each department regarding information technologies and eGovernment. Its functions among others are: Develop strategic plan for the department, from the proposals of the various public bodies and agencies concerned; To monitor, within the department, enforcement of guidelines and monitoring the course of action agreed by the Higher Council for Electronic Administration; and Issue the reports in relation to recruitment files relating to information technology. To realize a national strategy, strong leadership is required. Among other things, top e-government officials can bring together key stakeholders across ministries and agencies, define shared needs, identify potential gaps and redundancies in implementing strategic goals, and guide e-government innovation in service delivery. They can also steer process redesign efforts, facilitating communication among departments, highlight best practices, and leverage shared solutions. Given the mandate to do so, they can identify and remove common barriers to one stop service provision as well. It is therefore vital to e-government transformation that governments appoint an official with real authority across departmental and ministerial boundaries to facilitate strategy and decision-making regarding the country’s ICT architecture, and assist agencies in their efforts to run more effective and efficient programmes. One measure to be taken is the establishment of a coordinating authority in the form of a chief information officer (CIO) or equivalent at the national level. Since 2008, United Nations E-Government Surveys have assessed governments’ organizational commitment to a whole-of-government approach by asking whether they have identified a government wide CIO or similar official responsible for overseeing e-government strategy. As seen in figure 3.1, the number of countries publicizing such a post has steadily increased. 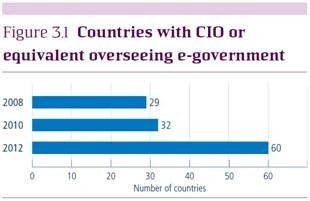 In the current Survey, 60 countries – 31 per cent of Member States – were found to have an e-government CIO or equivalent. This is up from 32 countries in 2010 and 29 countries in 2008. 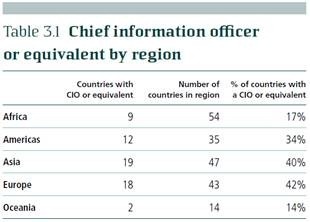 As shown in table 3.1, Africa and Oceania lag behind the other regions with only 17 per cent and 14 per cent, respectively, of countries identifying a CIO or equivalent. The percentages of countries installing a CIO or equivalent in the Americas (34 per cent), Asia (40 per cent), and Europe (42 per cent), however, are roughly comparable. In developed countries, the CIO or equivalent is typically responsible for providing policy leadership, supporting and monitoring open government initiatives, coordinating ICT projects across government to ensure they are aligned with overall strategy, and monitoring and reporting on spending. In developing countries, the role is oft en described in similar terms, but with the addition of building technology competence among government officials and improving and expanding ICT infrastructure and international cooperation with donors and NGOs on e-government initiatives. The CIO function may be situated at any level within a national administration, from a technical support group to a ministerial office. Given the emphasis on ICT inherent in CIO functions, responsibility for e-government coordination at the national level is assigned to a technology unit more often than not, frequently within a communications department. Only some 10 per cent of countries have a CIO or equivalent official placed in a senior position in the cabinet office, finance ministry or public administration department, among them many top-performing high-income countries such as the United States, the Republic of Korea, the Netherlands, Canada and France. Association of the national coordinating authority with the executive or reform elements of public administration serves a dual purpose. First, business ownership of e-government at a high-level assigns responsibility for government modernization to those responsible for the design and management of public services. Second, it imparts to the CIO function a significant convening power that facilitates national strategy development and ongoing collaboration. The authority to bring different constituencies together to address common problems may be especially important in large countries having a substantial number of administrative divisions. The institutional realignment needed for effective e-government echoes responses to questions of coordination and participation that arise in other areas. In particular, the e-government experience can be taken as an important lesson learned in the design of institutional frameworks for sustainable development. However, despite its evident value, the CIO or official with an equivalent function is not always easy to identify. Fewer than 10 per cent of leading e-government officials use “Chief Information Officer” as their functional title, preferring instead appellations such as “Director-General” or “Head” of the organizational unit mandated to undertake e-government coordination activities. The variety of arrangements and difficulty establishing exactly who is responsible for overseeing administrative reform processes at the national level is indicative of the evolving nature of the institutional frameworks for e-government development and the absence of global norms in this area.